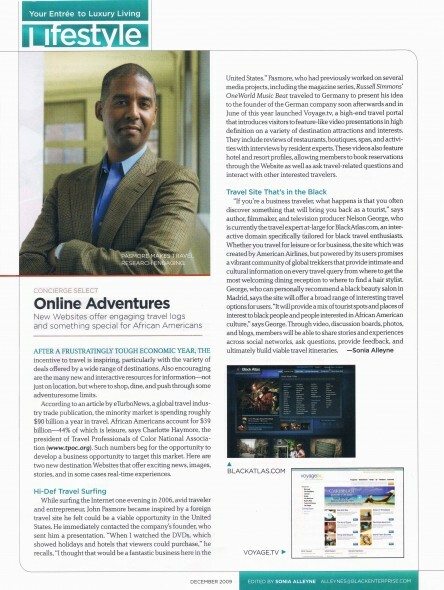 Black Enterprise gave me and my then partner Eddison Bramble some of our first press more than a decade ago when we had launched New Image Media, “A Hair Rasing Success.” Recently they came thru with piece on Voyage.tv. It’s in the December issue, but errr don’t see it on their site. Here is a PDF. This entry was posted by John Pasmore on Sunday, December 6th, 2009 at 8:59 am	and is filed under Marketing, Media and tagged with Black enterprise, john pasmore, Travel, voyage.tv. You can follow any responses to this entry through the RSS 2.0 feed.